I recently had the privilege of joining partner advocates at the Rhode Island Organizing Project (RIOP) at a “house meeting” in the Providence community. RIOP staff have long used house meetings as a powerful organizing tool, gathering consumers in comfortable settings in or near their homes to engage in meaningful conversations on important issues that affect their health and well-being. The gatherings have a particular focus on vulnerable and historically disempowered populations such as low-income older adults and people with disabilities, including those in minority communities. 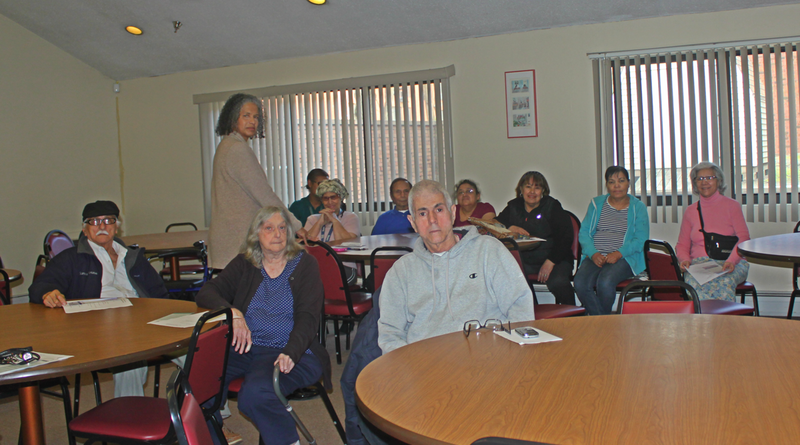 This meeting was at a low-income senior housing residential building. There were 12 attendees and eight were Spanish speakers with limited proficiency in English. I was so happy to be there and have the opportunity to hear from the Latino community while serving as a translator for the RIOP organizer. The major issues attendees talked about were their difficulty in getting access to home-based care and needed dental, vision and hearing coverage. Several older adults also spoke about their isolation, which was very compelling. This was the first time that RIOP organizers were reaching out at the residential level to the Latino population in Providence. They were able to provide vital information about help with the new 50-cent fare on the city bus system for people with disabilities and adults over age 65. Previously, those two groups rode Rhode Island Public Transit Authority (RIPTA) buses free. RIOP and other advocates fought hard against this new fare over the past years, but it went into effect in February of this year. Now that it’s here, the one option to soften the blow is a RIPTA card that provides 10 free trips monthly. This is not much, but it is vital assistance to low-income people struggling to balance all their needs each month on very limited funds. RIPTA had posted the application for this program online in several languages, including Spanish, but finding it requires access to and familiarity with computer use. So, for many of these Spanish speaking folks, this was the first time they were learning about this benefit’s existence. After the meeting, they went directly to City Hall to obtain their 10-ride bus passes. They also learned about the new INTEGRITY Plan, the state’s recently launched dual eligible demonstration project at Neighborhood Health Plan of Rhode Island for older adults that coordinates all Medicare and Medicaid benefits and services. Some of those eligible had received letters in Spanish about this new plan but still needed more information and clarification. They were confused as to why their existing insurance plan was asking them to consider this new plan, and worried about making any changes that might interrupt their current care. The RIOP advocates were able to provide them with the contact number of the ombudsman program for the Integrity plan, which offers information in Spanish. These were two practical and empowering things these consumers learned about at the meeting. What this experience reinforced for me is how much people long to be heard and understood. I learned that there is a pressing need for health care information for the Latino population. It is not enough to simply know about their issues and fight for what we think will benefit them, but that we need to be able to meet and engage personally with people across a diverse range of communities. That is what the advocates in Rhode Island are doing by revealing their presence to this community. They are building meaningful new relationships; they are building bridges. RIOP advocates understand that all people have the right to be informed of decisions that affect them, to be involved in the process and to participate actively in their own health care. By attending these meetings, sharing their stories and partnering with local advocates, consumers from diverse language communities can in turn play a major role in working for just, consumer-centered health care policies.